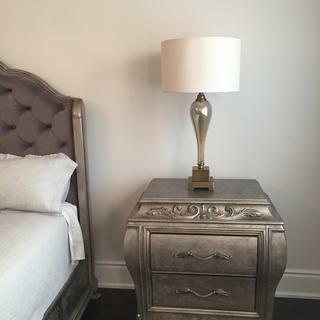 Make a stunning statement with this mercury glass table lamp topped with a beige shade. Transitional in style, this stunning table lamp makes a great focal point for any room. A mercury glass base is topped with a beige drum shade, creating warmth and shine. A bronze metal pedestal base completes the look. Overall: 32" high. Shade is 16" across the top and bottom x 10 1/4" on the slant. Square base is 5 1/2" wide. Weighs 7 lbs. A luxe table lamp design by Possini Euro Design®. Bronze finish metal; beige shade. It is a beautiful lamp and I believe it will go well with my new bedroom set. The elegant, transitional style, but not too contemporary. I chose these lamps because they are the right height and hopefully will compliment my living room well. I have off-white walls, dark, wooden furniture and gold draperies. It is a very pretty table lamp from the picture! I liked the height and the shape and the color. What are the base dimensions? BEST ANSWER: Hi, the Square metal base is 5 ½” X 5 ½”. What is the distance between the bottom edge of the shade to the surface it rests on? BEST ANSWER: It is approximately 22". BEST ANSWER: Hi, the table lamp weighs 7 lbs. About 6-7 lbs. A beautiful lamp. Especially for the price. It is heavy. It will not get budged easily. Can you use a 3 way bulb in this lamp? BEST ANSWER: Hi - this lamp can use up to a maximum 150 watt bulb, but it does not have a 3-way socket. If you use a 3-way bulb in it, it will just turn on the the maximum wattage of the bulb. No, it does not have a 3 way bulb socket. What color would you say the mercury glass is for the Gigi Mercury Glass Table Lamp? BEST ANSWER: I am an interior designer who just purchased these lamps for myself. I am thrilled with them and have gotten many compliments. The Mercury Glass is silver with gold marbling. Overall it comes across as a very soft warm silver color. When the light is on. And a little stronger silver shade in natural daylight with the light out. An even shade of silver width gold flecks - about half and half. Love everything about this lamp and would highly recommend it to anyone looking for function and style in a lamp. The delivery was speedy. Lamps were packed quite well. As the first two shades did not match in color well enough. I ordered a 3rd lamp and returned one of the first two. My experience with customer service was exceptional. The return went well, very easy. I purchased these lamps to help blend gold and silver in my new living room. I needed a tall lamp since I have 9' ceilings. These look great and are exactly what I needed and wanted. Had to wait a couple of weeks for the second lamp. I was leery about them charging for it before I was in possession of the lamp. But the lamp came 1 day before expected date. These are perfect with the silver and gold crackle finish! For the price they look high end and very stylish! Love these lamps and would defenitely recommend ! Lamp looks nice but is very light and that makes it top heavy. These lamps are very stylish! These lamps are perfect in an office setting. They look high end and we are very happy with how they add to the office décor! This matches perfectly with the two Possini end table lamps. It gives the living room a new, updated flare. These lamps are beautiful and high quality. Love the feel of the switch. They really freshen up the feel of the room. I love this lamp! It is very stylish and attractive and is tall. I have it in my family room with my grey and deep yellow sofa. This lamp is very elegant and expensive looking. I have it in my bedroom and it looks lovely. Not only is this lamp beautiful and elegant, I had no idea a lamp could turn on and off so effortlessly. I swapped out two vintage midcentury lamps for these and they really gussy up my living room. Understated elegance with great light output.